When it comes to improving your business performance, data is a good thing. But having too much data can be even worse than not having enough—you’ll get so buried in reports that you’ll miss the most important indicators of your business health. Focus on distribution KPIs to get a clearer picture of your business with less effort. Find out how in a new white paper by Acumatica. What historical and predictive KPIs can tell you about your business. 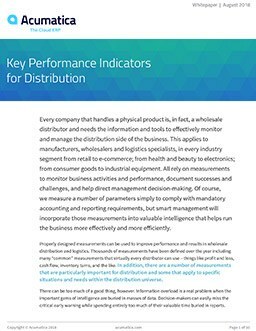 Which three distribution KPIs to track most closely. Why out-of-the-box KPIs aren’t enough to improve performance. The ideal number of KPIs to track on a daily basis. Give your business an advantage over competitors who are drowning in meaningless data. Download the white paper now. This white paper is offered by Acumatica, a leading provider of cloud business management software that gives mid-sized contractors a complete, real-time view of their businesses—anytime, anywhere.